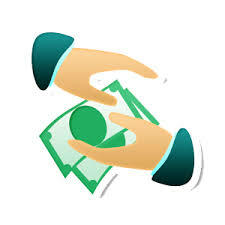 Freelance Writer Guide Asks: Is Interact Media legit or is Interact Media a scam? UPDATE 5/25/16: This site is no longer a legitimate or trustworthy work option for new freelancers, in the opinion of the Freelance Writer Guide. Read our explanation here. 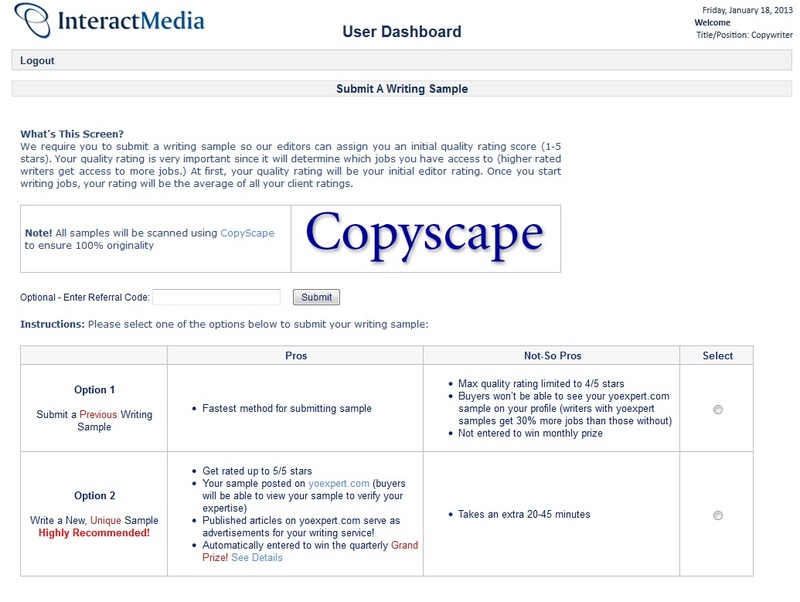 Interact Media, also known as Zerys, is a content mill site, in the realm of Textbroker and Media Piston. 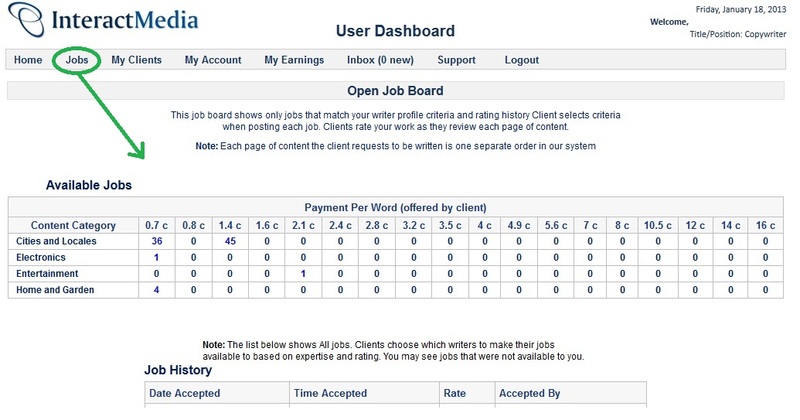 The site uses a job board to present writers with projects. An initial star rating system, based on a writer’s sample, is used to determine what tasks are available to a given writer. How do I get started at Interact Media? Email auto-received after filling out form. Whoa. Lot of stuff to do! Once you’ve confronted the checklist, you’ll need to roll up your sleeves and dig in. Requisite profile “stuff”. An image is required. Lengthy signup contract. Logs your IP addy, which I’m not keen on. Here’s where things start getting complicated. Your next step is to pick “expert” categories to denote what subjects you will write about. Simple premise and not wholly unexpected, but there are four levels of each category, and a host of sub-categories in levels 2, 3, and 4. These sub-categories are extremely arbitrary, with paths for things like family > family crafts > craft terminology, and the inability to leave off if there’s further availability in the “path” – in that example, you couldn’t stop at “family crafts,” for instance. You must choose ten permutations and you must restrict yourself to no more than 5 level one categories. Sorry, renaissance people – you only get to be so talented. Random category paths I picked out for this walkthrough. Once you manage to get through the odd system of category-picking (you can choose up to 100 paths, by the way, if you have hours to kill) you move to the inevitable sample page. I will give IM credit in that they allow you to choose whether you want to submit an already-written sample or create a new one, but the fact they expect the new one for free kind of cancels that credit out. Cue skepticism re: every place that’s ever fished for free writing, citing “valuable exposure”. Gee, it’s not like they -emphasize- one over the other or anything.. Assuming you decide to continue from there, you can expect an email a few days later with a congratulation message for making it inside, along with your editor-issued star rating. (From here on out, your rating will be entirely dependent on client ratings of your work.) What they’ve neglected to tell you until now – and what you’ll quickly discover – is that while there are 2 and 3 cent/word jobs that show up on the boards, they’re few and far between, vastly outweighed by the appalling .007/word work. No, that’s not a typo of 7 cents, readers – that seven tenths of ONE PENNY per word. I’ve never in my career seen a legitimate American site paying such horrible rates, and I was very, very disappointed to find that a fairly well-known site is responsible for perpetuating that it’s perfectly fine to pay skilled, native writers in fractions of a penny. How do I get paid at Interact Media? 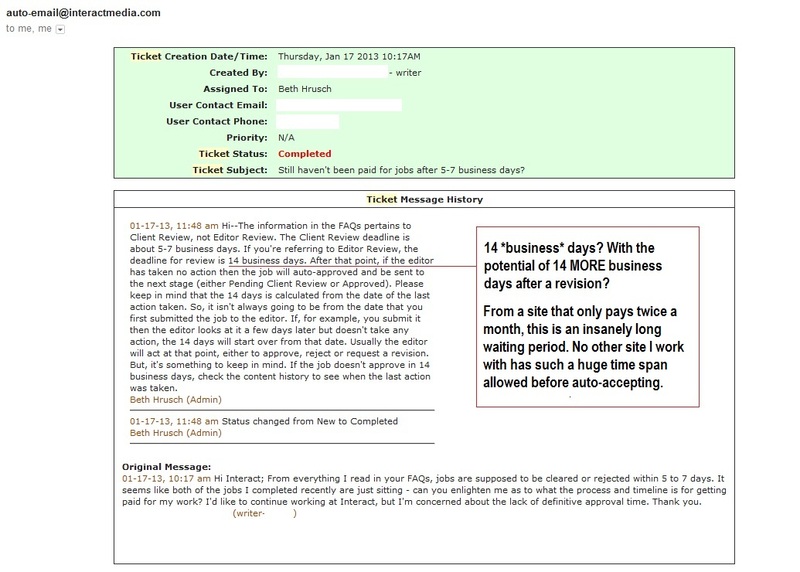 Screenshot of an actual email. How is the overall experience at Interact Media? For me, it was terrible. After waiting for the better part of two weeks to get a measly $5 article approved, a $12 piece I had labored over (an article subject instructed to be tied in with a business that had nothing to do with it, along with links) was unceremoniously rejected – literally the first time in 8+ years of writing on content sites that I’ve ever had that happen. No recourse, no appeal, no revision attempt or opportunity allowed. Just a dismissive digital hand wave and my hard work left me with nothing but a highly-branded piece on a very odd subject that I had no hope of reselling. Helpful Hints for Interact Media? If you decide to try it out, do yourself a favor and check out a client’s profile prior to accepting a project. There will likely be telltale comments from previous writers if he or she is difficult to deal with, or exceptionally demanding. Don’t rely on this site for fast money, as the review times are absurdly long and they only pay twice a month.